The 223-pages book published by Springer is available as a hardcover (ISBN 978-1-4614-0313-5) or as an E-book (PDF) version. It offers a guide to bridging the gap between theory and implementation of CAN and provides examples and practices for design of communication systems, as well as time and reliability analysis of CAN communication. 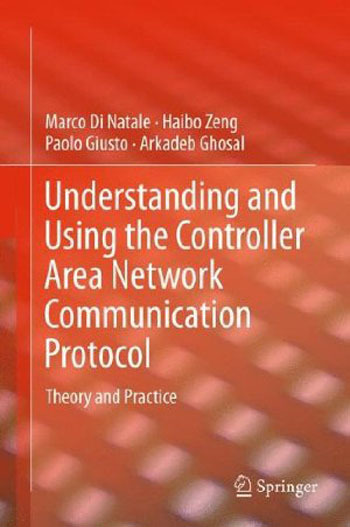 The book should improve the reader’s ability to design, analyze and debug a communication infrastructure based on CAN. The book focuses on the practical implementation of the CAN communication stack and the implications of design choices from the selection of the controller, to software development and architectural design. Designing, analyzing and debugging of a CAN-based communication infrastructure are the main book topics. Offered is a range of architectural solutions and domains of analysis. Formal models and analytical results, with thorough discussion of their applicability are provided. Thus, the book may serve as reference for researchers and students, as well as practicing engineers. The 144 included illustrations help for a better issue understanding.